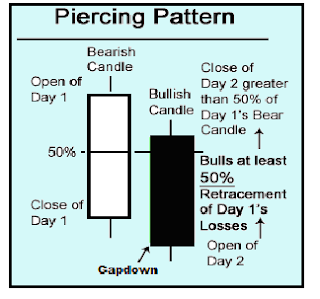 closes significantly into the losses made previously in Day 1's bearish candlestick. increasing the level of demand. The Japanese developed a method of technical analysis to analyze the price of rice contracts. 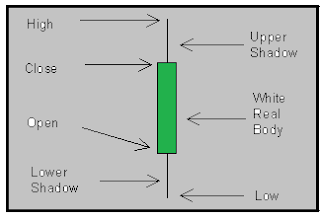 This technique is called candlestick charting. Steven Nison is credited with popularizing candlestick charting and has become recognized as the leading expert on their interpretation. Candlestick charts are much more visually appealing than a standard two-dimensional bar chart. 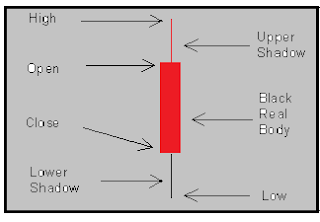 As in a standard bar chart, there are four elements necessary to construct a candlestick chart, the OPEN, HIGH, LOW and CLOSING price for a given time period. the open and closing prices. means the close was higher than the open (normally bullish). shadow, representing the high/low price extremes for the period.